Windows are an integral part of every home. They allow you to see out, let light and air in, and can dramatically change the appearance both outside and in. So when the time comes to choose new windows, it helps to weigh your options carefully to make the right choice. Both vinyl 1 and fiberglass 2 replacement windows are popular choices among homeowners and builders. We’ll outline the differences between them to help you better understand how each would work in your home. The majority of any window is glass, but there are a few differences in the frames between vinyl and fiberglass. From a distance, both are relatively similar. However, vinyl windows have an obvious join line at their corners, while fiberglass does not. 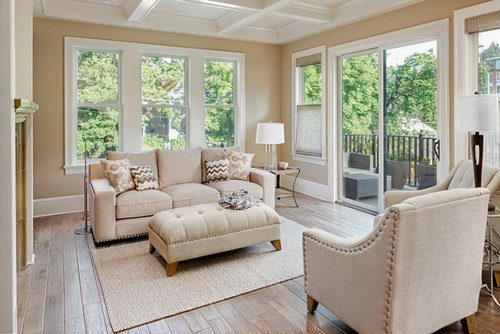 Fiberglass frames mimic the look of wood windows more closely, while vinyl windows are plainer. Fiberglass windows have more options for style and color because they can be painted, but this means that the windows may peel, fade, and require maintenance. Vinyl windows have a color that goes straight through, so they will not fade or peel and require no maintenance. 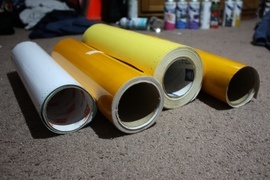 Vinyl is a flexible material that expands and contracts easily. Because of this flexibility, and the fact that the frames can be produced to within ⅛-inch of the window size, they can be installed much faster and more efficiently than a fiberglass window. Fiberglass is rigid, not expanding or contracting as much, which means that it can be more difficult to fit into the window opening, taking more time. A professional is usually recommended for the installation of both window types. However, some vinyl windows may be installed DIY, but fiberglass windows should not. In addition to the length of time and difficulty involved with installing the windows, fiberglass windows may take longer to arrive. Because the material is so new, fewer manufacturers make them, and fewer contractors keep them in stock, resulting in a longer lead time. Of the two types of windows, vinyl is the less expensive material, costing between $520 and $730 for a 48-inch window. Installation for each window is around $250, for a total of $770 to $980 for each window installed. Fiberglass costs on average about 10 to 30% more, so a 48-inch window will cost between $572 and $1,693. They also cost more to install, at around $300 each for a total of $872 to $1,993 for each window installed. Fiberglass is up to eight times stronger than vinyl, which means that with care it can last significantly longer. A good quality vinyl window is rated for up to 30 years, and fiberglass windows can last 50 years or more. The reason for fiberglass’ superior strength is its makeup. 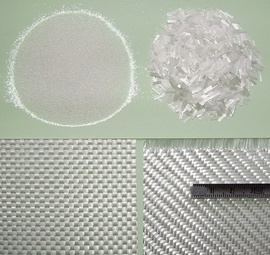 Both frames are made of a type of plastic, but fiberglass frames are reinforced with glass fibers, which adds considerable strength to the product. This means that the windows can have thinner frames with more glass. The fiberglass frame does not weaken in the sun like vinyl, which can expand and contract with the heat. At temperatures of more than 165 degrees, vinyl begins to melt, which can cause problems on extremely hot days, distorting and warping the frame. Fiberglass maintains its integrity even in hot temperatures. The same glass fibers that make fiberglass window frames better energy insulators also make them better noise insulators. Fiberglass is one of the best noise insulators available. Vinyl does not have the same insulating properties, which means that noises from the outdoors may travel through the frame more easily. Both types of windows are considered low maintenance. However, both require some care over time. Fiberglass windows may fade or peel and need to be repainted. Vinyl windows may warp or contract, which can cause a poor air seal that needs to be filled with caulk periodically to prevent air from coming in. However, both are durable materials. Vinyl has welded corners that prevent air or water leaks when properly fitted into the frame, while fiberglass does not warp or contract, so it sits tighter in the frame and does not leak. In the event of damage, vinyl windows may be marginally easier to repair because the flexibility of the frame means that they are easier to remove and install. Fiberglass windows are better insulators than vinyl. They are also less likely to develop an air gap over time, which accounts for as much as 30% of the energy you use to heat and cool your home. 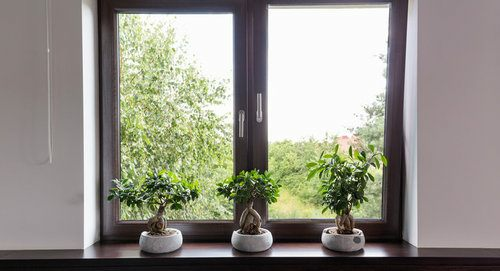 For this reason, fiberglass windows are considered the greener choice. How much does it cost to install vinyl or fiberglass windows in my city? Cost to install vinyl or fiberglass windows varies greatly by region (and even by zip code). To get free estimates from local contractors, please indicate yours.